to the hotels on the islands. Trek on four beautiful islands, all with their unique characteristics. Tinos for its cultural richness, Mykonos for its postcard white and blue ice cube like buildings and crystal blue seas, Santorini for its notorious breathtaking views and Naxos for the challenge of climbing Mt Zas, the highest peak in the Cyclades. This programme is designed for travellers who wish to explore the Greek islands, but at the same time able to enjoy the pleasures of their accommodation and to sit back and sample Greek delicacies in local tavernas. The Cycladic complex of islands is the most representative of the archetypical Greek style. Fishing villages with whitewashed flat roofed houses and narrow streets, hundreds of chapels, rocky landscape contrasting with the deep blue sea and bays with powdery white sandy beaches. The aim of the tour is to take you to the best spots as well as to the interior of the islands where you will discover the culture and habits of the islanders. Meet at the airport with your guide. There is one major transfer (arranged to suit the majority of clients) from the International Airport Eleftherios Venizelos to the hotel, which is conveniently located in the heart of Athens. Settle into the hotel. 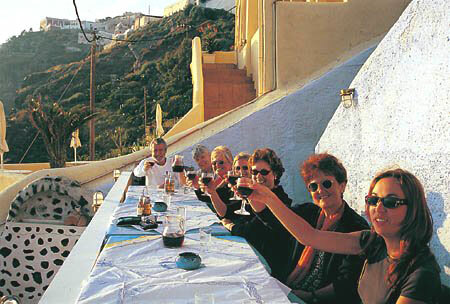 In the evening meet with your guide for a short walking tour of Athens and enjoy a welcome dinner in a traditional Greek taverna in Plaka, the old part of Athens, overlooking the Acropolis. After breakfast, a half day sightseeing tour of Athens, host to the Olympic Games of 2004. Visit the Acropolis, the greatest monument in the Western world, the Parthenon and the Panathinaikon Stadium, where the first Olympic Games were held in 1896 and the 2004 Games. Lunch in a taverna, either by the Port of Rafina, the second largest in Athens or in Plaka, after the sightseeing tour. Early in the afternoon, approximately at 14:00 or 16:00, depart for the island of Tinos by high-speed catamaran. Duration of trip approximately 1.5 hours. Transfer to your hotel overlooking the sea. Afternoon free to visit the miraculous icon of Our Lady in the church by the Port. After an early breakfast, by taxi or private air-conditioned bus - depending the size of the group, to the village of Falatados, where the trek starts. 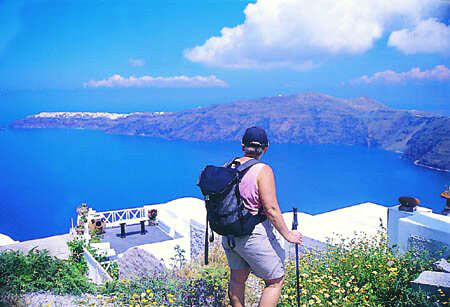 Heading uphill to Exomburgo, to admire the stunning view of the Aegean. Continue onwards to the village of Koumaros, for a short break and try the traditional Greek coffee, before continuing to the village of Volax and Agapi, which is the finishing point of the day’s trek. Returning back to the hotel in the afternoon. 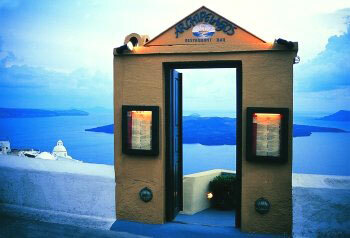 In the evening, dinner in a local taverna to taste the island dishes. Overnight at the same hotel. 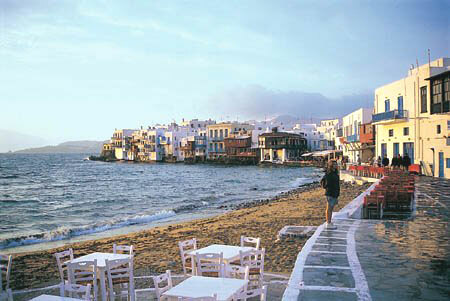 After an early breakfast, depart to the port to catch the boat to Mykonos Island, duration of the trip 15 minutes. After settling into the hotel, a small boat ride to the historical island of Delos. Time will be spent on the island discovering its ancient ruins. A picnic lunch on Delos before the short return journey to Mykonos. Before dinner an evening walk in the internationally acclaimed Mykonos town. 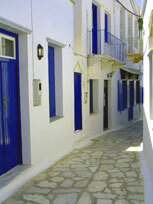 Walk along its small winding streets and ice cube like buildings, the archetypal postcard image of the Cyclades. Dinner in a little taverna in Little Venice. Overnight in Mykonos Town. Please note that the boat transfer crossing to the island of Delos may not be permitted due to weather conditions, in this event the guide will take you on a trek on the island of Mykonos. Transfer by high-speed boat to Naxos Island (via Paros Island) in the morning, the largest and most fertile island of the Cyclades. Arrival on Naxos Island in the afternoon. Settle into the hotel. By taxis to Koronida village, where the trekking starts. Duration of the trek approximately 3 hours, downhill, ending in the seaside village of Apollonas and its famous statue of Kouros. Return to the hotel by private bus or taxi. 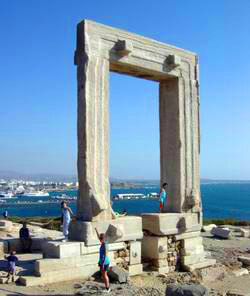 Rest of the afternoon free for swimming or an optional visit of the old part of Naxos town. After breakfast, departure by taxis to Apiranthos village, a short visit of the picturesque village with its three small museums and then the walk starts. Walk towards the highest peak of Mt Zas of 1,004 m altitude and then continuing downhill to the village of Filoti. Duration of trek approximately 4-5 hours and then descend via the asphalt road, no traffic, back to Filoti village for a taxi back to the hotel. Rest of the day free. 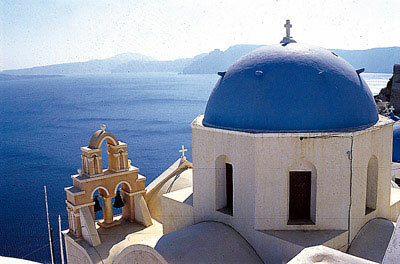 After breakfast, transfer by high-speed boat to the fairest island of the Cyclades, Santorini. Arriving early in the afternoon, around 14:00 and settle into the hotel. Rest of the afternoon free to admire the breathtaking views of the volcano. Meet in the evening for dinner. 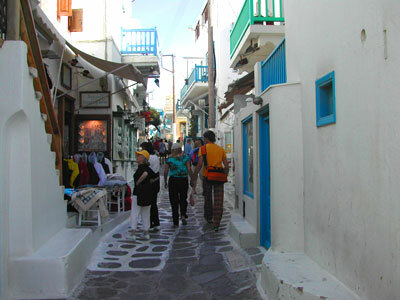 After breakfast, the trek starts from the main town of Fira. The path starts from the cable car station. For the first 40 minutes, it is a stone-path, which then becomes a footpath. Ending in the village of Oia, famed for its sunsets. Approximate duration of trek, 3 hours. Then return to Fira, either on foot or by taxi. Rest of the day free to explore the island, either visit one of its famous wineries or the archaeological site of Acrotiri. Dinner in a taverna in the evening. Free day for swimming on the black beach of Perissa or optional excursion to the still active volcano. Late in the afternoon transfer to the International Airport of Santorini for the flight to Athens. Transfer to your hotel. Farewell dinner in Plaka. After breakfast, transfer to the Airport for the flight home.